Mary was born in Pasadena, CA and has spent her life in the San Gabriel Valley. 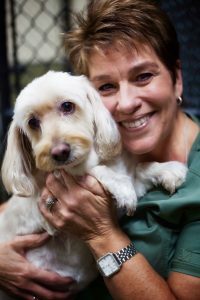 Her passion for animal care started over 27 years ago where she began working in an animal clinic. 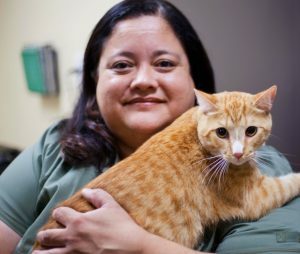 In 1990, she began her career here at Cypress Animal Hospital, started out has Vet Technician and working her way up to becoming the Hospital Administrator. When Dr. Gerry retired in 2008, she knew that she wanted to stay here in her home at Cypress. In 2008, Mary, along with Dr. Swindall purchased the practice. Mary loves working with the patients and interacting with the clients. She enjoys exploring new and innovative ways to keep customer care and service top notch. In her free time, Mary enjoys traveling and spending time with her friends and family. Dr. Swindall is a veterinarian and owner of Cypress Animal Hospital. 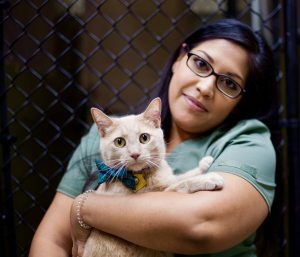 Wanting to be a veterinarian ever since she was 4 years old, she graduated from Colorado State University’s veterinary medicine program in 2002 after first receiving her Bachelor’s degree in Biology from Boise State University. While in school, she expressed interest not only in the care of dogs and cats, but also exotic animals. Her love of all creatures from the tiniest lizard to the largest elephant led to numerous internships at various zoos across the United States from Utah to Colorado to Tennessee to Florida to Rhode Island and to New York. 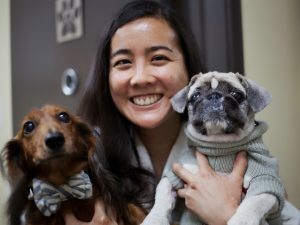 Upon graduating from veterinary school, she came back home to California and began working in a very busy multi-doctor practice in the valley. However, she found she preferred the more intimate setting a single doctor practice offered. 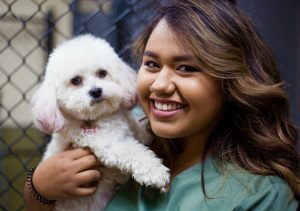 She initially worked as a relief veterinarian for Cypress and then grew to take over and eventually become part owner 10 years ago. She enjoys all aspects of medicine and surgery but especially has gained interest and expertise in chronic diseases such as diabetes and kidney disease. Because her mother is completely blind, she has always has a special interest in ophthalmology which also led her to additional training at UC Davis. She has been married 23 years now and has 2 handsome sons, now ages 13 and 10. She is proud that they are both Boy Scouts and enjoys being active with them and seeing them grow in the program. She is also of Native American descent and is very active with her Tribe holding a seat on the Tribal Council. Through her tribe’s efforts to save sacred sites, she is also President of the Friends of Whittier Narrows organization. This work keeps her very busy working with various governmental entities and universities. She has also become a published author, helping to write the Tribe’s first book on their history (Toypurina – the Joan of Arc of California). She also enjoys playing piano – professionally in the past, but just for fun now. 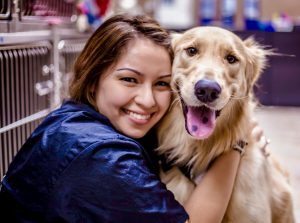 She hopes you find Cypress Animal Hospital unique – a place where you’re treated as one of our own in a facility that can offer the latest and most advanced diagnosis. Dr. Jennifer Boyle was born and raised in Monterey Park, CA. She obtained a degree in Animal Science from Cal Poly Pomona. She acquired a DVM degree from Western University of Health Sciences in the charter class of 2007. She enjoys cycling, hiking and photography. 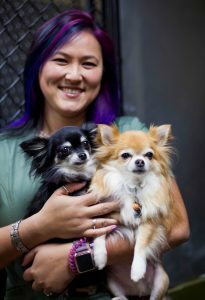 She currently lives in Glendora with her three adopted dogs: Benji (Maltese), Winston (Pekingese) and Kirby (Dachshund). Her veterinary interests are in dentistry and surgery. Michael grew up in Glendale, California in a family that always included pets. In 2008, he began his career assisting veterinarians. 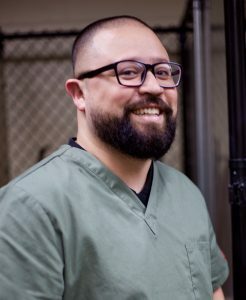 Michael started out working in a very busy spay/neuter clinic, where he developed his experience and love for animals. He eventually worked his way up to full service hospital. He currently enjoys spending his free time with his two sons and loving wife. Michael’s passion and love for animals is evident in the work that he does. He always goes out of his way to make sure each patient is as comfortable as possible. Hi! My name is Neiva. I was born and raised in Orange County. I have always had a passion for animals. Growing up, I quickly figured out that working in the animal field was what I wanted to do. In high school I took an animal science class and I was hooked! I am currently attending Carrington College working towards my RVT (Registered Veterinary Technician) license. In the future, I hope to continue my schooling and further my education by becoming a veterinarian. 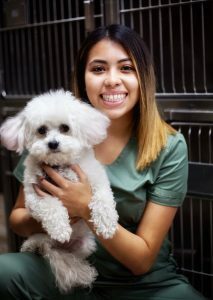 Working at Cypress Animal Hospital, I hope to help our clients in any way I can in caring for their pets and making sure they are as healthy as can be. Hello everyone. My name is Sol. I’m a person who enjoys a simple life. In my spare time I like to spend time with family and friends. My idea of an exceptional good day is going to Disneyland – I love everything about with Disney. Since I was a little girl, I have had a love for animals as I always had pets growing up. I love helping animals any way I can as they bring a warmness to my heart. I am currently the hospital’s head receptionist but I also have many technical skills. Your pets are a part of your family too and I hope I can help bring joy and comfort to your visit at Cypress Animal Hospital. I was born in West Covina and raised in San Dimas. Big or small, furry or scaled, I’ve always have had a love for all animals. That love was encourage by my wonderful parents who were also animal lovers. I currently have a menagerie of pets from lizards and tortoises to birds, dogs and cats. It’s a crazy home but I love it! Each one of my pets brings me such happiness and that’s what I like to see in our clients – a never ending love for our furry/scaly family. 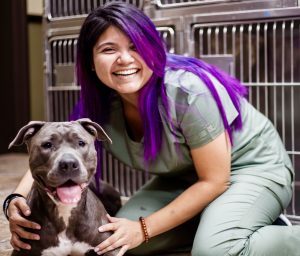 After completing my Associates Degree at Citrus Community College, I transferred to Cal Poly Pomona to pursue my major in Veterinary Sciences. Unfortunately, due to a health snag I had to take a medical leave from school. I have been a veterinary technician now for 15 years! I take great interest in my work and strive to continually educate myself to provide the best care I can to our patients. My hopes are to complete my degree at Cal Poly and move onto getting my DVM so that I can help as many animals as I can to have happy healthy lives. Hi! My name is Sara Irene Iniguez and I grew up right down the street from Cypress Animal Hospital. I now live in Azusa and am truly happy to be able to work where I once spent my childhood. I am family orientated and have always found comfort in being around animals. I have experience in volunteering with adoption agencies and a number of shelters. I spent a few years at UC Santa Cruz and then went on to graduate from Carrington College from which I obtained an Associate’s degree in veterinary technology. I am currently working towards finishing my bachelors and hope to continue my education in veterinary medicine. Eventually, I hope to work in the fields of emergency medicine or wildlife conservation.